I did not know what Big Brother was about, had never watched it. I could give up TV, rarely watch it, but I do know how it is not to know a lot of my son as an adult. It is hard when they get older and get a life of their own, even though that is what we prepare them to do. He wants to live in that fishbowl? Ah well, I guess someone would have to want to do it. I wish him luck. Hi Lynda, I saw your comment on Arlee Bird's post about losing a follower and so I came to your blog to visit. It's a nice blog, looks interesting and I decided to follow. Maybe that will make up for losing one. I know how you feel. I never pay attention if I lose followers on Twitter or friends on Facebook, not even sure what those numbers are. But the blog? Hehe, that's a different matter! It's not like the old days any more where we can get blog followers so easily. Now, it's hard not to lose them one by one by one. Enjoy the A to Z challenge! I'm not doing it this year, will probably sit out the month of April at least for posting, but will definitely enjoy visiting participants and checking out what everyone's themes are. Karen, Thank you for visiting my blog and for the nice comments about my blog and especially welcome as a new follower! I'm gearing up for the A-Z. I hope I can make it through! Hi Lynda, I'm your newest follower. I wish I could be magic number 100, but I'm 99, but like the others said, numbers don't mean anything, it's the quality of the interaction with the people who follow. I have followers on Twitter who I'm certain are nothing more than spammers, but I don't know how to get rid of them. I mean Twitter isn't like FB, we don't have to accept their friend request so a bunch of eggheads can stalk (I mean follow us) LOL. I have to go back to Arlee's site and learn how to create my signature. I've been meaning to do that all month and now it's the end of the month and I haven't done it. I just dropped by because I'm going to be traveling all day tomorrow and into the night. Luck of the dang calendar, I suppose. It's the end of my kids spring break. Actually we were supposed to be in Florida until Sunday, but apparently a tropical storm is headed our way so we are headed out very early in the morning in the hopes of beating the storm and not driving right into it as we head back to Louisiana. Long story short (kind of short) I'm not going to be anywhere near a computer or wifi on the first day of the A to Z challenge so I won't be able to visit any blogs on day 1, bummer, (this is me making my sad face). You mentioned losing a son. I know the agony of losing a child. I lost two daughters at a young age. 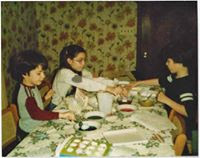 They were triplets with my only surviving triplet girl, Blake. All three developed meningitis, pneumonia and RSV. Blake is lucky she survived and considered our miracle child. I became very protective of my other children after that, but had to learn to let them live. Coming from a large family, I have four sisters, all living, and I had five brothers, but only one is still living, my family has suffered a lot of tragedy. Three brothers died in three separate car accidents over a long period of time. One died in 1980, one in 1990 and one in 2003. My other brother died of lung cancer in 2012. I'm very familiar with loss. I know what you mean about boys, it seems when they grow up and marry or become involved (mine aren't there yet, still at home - teenagers), they go with the wife and girls stay close to home. Like for holidays and special events. I hope I'm making sense. I guess the wife will always want to be close to her family and that is reasonable and the husband accommodates the wife and if they happen to live out of town then you may not have as many opportunities as you would like to see your son. At least that is how it has always been in our family and in most of the families I know. Once children are born, families gravitate toward the wife's extended family for all major holidays. My mom would have gone batt crazy if my husband, kids and I didn't come home for the holidays. Eventually his parents began traveling from Chicago to Louisiana for the major holidays. In our defense, I did have a huge family and even larger extended family and he was an only child as was his mom and his dad didn't really have any close relatives. We spent the off holidays with his family, like St. Patricks day, and every other Thanksgiving. Okay, I've gone on for long enough. I can see why you would love to see your son on this show, which BTW I had no idea what it was about. TV is the one electronic I could give up. I'll be back on Saturday to catch up on your A to Z posts. Looking forward to reading them. Thank you, Melissa, first for your kind words and second for following my blog. Welcome! I am so sorry for your tragic losses. My heart goes out to you. I'm looking forward to connecting with you during the A to Z Challenge. I think I could do without TV. I could probably do without the internet for a short time, provided I had another way of connecting with far-flung family/friends. The books and other reading material would totally be a deal-breaker for me. I spend quite a bit of time thinking about how well I know my adult children (or how well I don't know them as the case may be) so can totally identify with your sentiments in that regard. As a side note, my daughter recently went to an audition for MTV's The Real World. Her primary goal regarding the show was to get on it so she could then be on the companion competition show The Challenge, which involves extreme physical challenges in addition to living in a house with a gazillion other people. It has driven her crazy for years to watch it because she is completely convinced she could outperform pretty much every young woman she has seen on the show. She may even be right, but she hasn't heard anything yet. Hello Lynda! good to be reading your blog again. I, too, am a huge Big Brother fan. How much fun it would be if your son gets on the show!! Hello Paula. 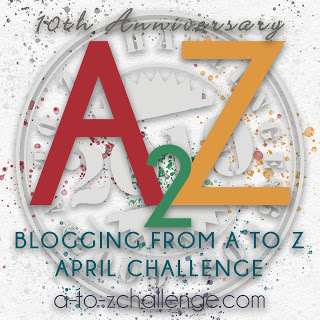 I'm checking your blog out too for the A-Z challenge. I can't even imagine what it would feel like to see him on TV.